The temple is lit with one lakh lamps on Aadi new moon day in July-August. 10 day Purattasi Navarathri for Parasakti in September-October; Brahmmotsavam in Aipasi (October-November) and in Panguni (March-April); Margazhi Tiruvadhirai in December-January; Thai Float festival in January-February; Panguni Uthiram in March-April are the other festivals celebrated in the temple. 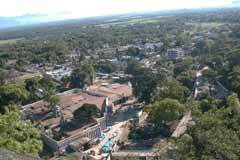 The temple is open from 6.00 a.m. to 12.00 and from 4.00 p.m. to 7.30 p.m.
Sri Kuttrala Nathar Temple, Kuttralam-627 802, Tirunelveli district. Lord Vallaba Ganapathy graces this holy place. Lord Muruga in the temple prakara appears with a bow in His hand with His consorts Valli and Deivanai facing each other. There are a number of Shivalingas on the water falls rocks as if performing abishek to Lord. The water from the falls - performing abishek to Lord- is considered very sacred bringing benefits to devotees bathing here. There is a shrine for sage Agasthya and one for his disciple Shivalaya Muni opposite. The statue of Shivalaya Muni is placed under the feet of Sage Agasthya as a mark of respect to his Guru. Those mentally retarded and suffering from skin troubles get all relief with a bath in the falls and prayer to Lord Kuttralanathar. Those suffering from intense headache use the Thaila Prasad (Oil Prasad) and rub it on their foreheads for cure. The temple has five entrances representing four Vedas and the one being the way of Pilavendhan who came to enjoy the dance of Lord Shiva. The design of the Dwarapalakas is different as if they are in a conversation. This was a Vaishnava temple earlier. One Dwarapalaka is asking the other whether Saga Agasthya came there and the other replying in the negative. The devotee can worship all the Panchaboodha Lingas representing water, earth, fire, vayu and the space here. Of the five stages of Lord Nataraja dance – Golden, silver or Rajatha, copper, Ratna and Chitra- the Chitra Sabha is near the Kuttralanathar temple. Lord Nataraja graces in the form of a painting. The finger prints of Sage Agasthya on the Linga are still visible. When Agasthya pressed his hands on the head of Lord Perumal, it caused headache to Lord Shiva. As a remedy, a Thaila-oil is applied on the head – Shivalinga Bana – during the 9.30 a.m. puja. This oil is prepared with cow milk, green coconut, sandal and 42 herbals boiled together for 90 days and mixed with pure gingely oil produced by grinding the Ellu in a traditional manner. This abishek Thaila-oil is offered as Prasad to devotees. Also the nivedhana offered to Lord during the Arthajama puja is a medicinal preparation made of a nut called Kadukkai in Tamil along with dry ginger, pepper etc. As Lord is always under the falls water, these are offered to protect Him from cold and fever attacks, it is explained. Of the Shakti Peetas of Ambika, this is Parasakthi Peeta. Ambika in the temple is praised as Kuzhalvai Mozhi Nayaki. The Wedding festival is celebrated on the Aipasi Pooram star day in October-November. Lord and Mother visit the Agasthya shrine that day to grant their wedding darshan to the sage. The story further goes that while sage Agasthya converted this Perumal temple as a Shiva temple, he changed Sridevi as Kuzhalvai Mozhi Nayaki and Bhoodevi as Parasakthi. 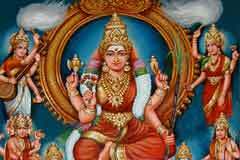 Mother Parasakthi is on a peeta of Sri Chakra design. As Bhoomadevi was changed as Parasakthi, this peeta is also praised as Dharani Peeta – Dharani means Earth or Bhoomi. Nava Sakthi Puja is performed on full-moon night here as the peeta is said to represent the collective grace and power of nine Ambikas. The main nivedhanas are milk and Vada the popular dish of Tamilnadu. As Sakthi is furious in nature, A Shivalinga called Kamakoteeswara is installed before the peeta to soften Her. Devotees worship Parasakthi in the Dharani Peeta on Fridays and Navarathri days with kumkum mixed with rosewater to realize their wishes. Manakola Nathar Shiv Shrine – Lord Shiva in His wedding posture – is in the prakara. Lord Vishnu with Mother Mahalakshmi offering His sister Ambika to Lord Shiva in wedding, Lord Brahmma as priest conducting the wedding rituals, Sages Agasthya and Brungi are also in this shrine. Those facing delays in their wedding proposals worship here with turmeric, rosewater abisheks offering fragrant garlands and Payasam –porridge nivedhana seeking a suitable match. 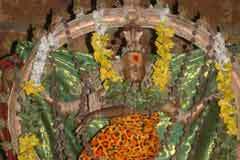 There is a shrine for Perumal in the temple praised Nannagara Perumal blessing devotees with boons of their needs. Lord Krishna also is nearby. Special pujas are performed here on Rohini Star days and Purattasi Saturdays in September-October. This Perumal was in the Shiva shrine earlier. A small shrine is constructed around the jack tree, the sacred tree of the temple with Adhi Kurumbala Easar in the form of a Peeta. The tree yields fruits throughout the year but no one picks them. It is strange that the fruits are of Shivalinga form. Kuttrala Kuravanji, an ancient Tamil literature portraying the life of the Kurava community devoted to Lord Shiva, describes that all the fruits are but Shivalingas. During important festival days, this fruit is offered to Lord Shiva as nivedhana. 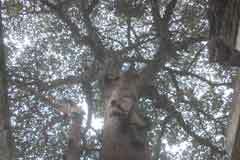 There is also a jack tree in the prakara dating back to centuries. This tree is revered as Lord Shiva by devotees offering Him all pujas. Arjuna lost in Kasi – now Varanasi - his small box containing the Shivalinga he was worshipping. Surprisingly, he got it back in this place. He left this Linga here itself after his usual worship. 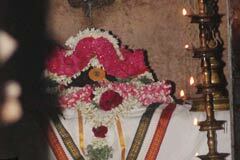 This Linga is in the Prakara in a separate shrine. Those who had lost anything worship in this shrine for recovery of the object they missed. Arjuna got back this Linga on the Panguni Uthiram day in March-April. Special pujas are performed in the shrine on this day. From this shrine, the devotee can have a view of the Linga, Vinayaka facing west, the vimana Tirikooda hills and the Kuttralam falls. The Chitra Sabha-hall of paintings is a separate shrine near Kuttralanathar temple. This Sabha or hall is made of copper. 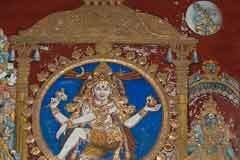 Lord Nataraja in the form of paintings appears as Tirupura Thandava Murthi. 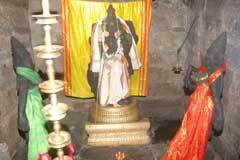 It is in this hall, sage Agasthya pressed the head of Lord Vishnu changing Him as a Shivalinga. The miracles (Tiruvilayadal) played by Lord Shiva and various forms of Lord Dakshinamurthi are beautifully painted here with colours made of herbals. A 10 day festival-Margazhi Tiruvadhirai in December-January dedicated to Lord Nataraja is grandly celebrated with car festival. The Arati shown to Lord Nataraja is offered in His dancing style, known as Thandava Deepa Aradhana. Lord Nataraja is dressed in white and green using fragrant Marikozhundu. 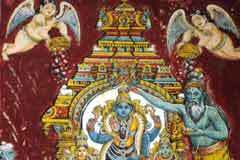 This puja is followed during the Chithirai Brahmmotsavam in April-May also. Ku means the cycle of births and deaths. Thalam means the remedy for this pain. Worshipping Lord in Kuttralam offers the solution. Due to an unmanageable crowd of Devas, Rishis to attend the Wedding of Lord Shiva with Mother Parvathi, north began to sink due the heavy weight and south began to rise up. To balance the ground level, Lord Shiva called Sage Agasthya to go south and said his single weight alone could solve this problem. Lord also assured the sage that he would be able to have the wedding darshan from Kuttralam itself, because, he changed Vishnu to Shivalinga and worshipped Him according to Makudagama rules here. Agasthya took the command of Lord and reached Kuttralam. But the Dwarapalakas of the erstwhile Vishnu temple denied entry to the sage. The sage, though upset, went to the nearby Ilanji Kumaran temple, made a Linga with the white sand and prayed for Shiva darshan. Lord Muruga appeared before the sage and suggested that he may enter the temple as a Vaishnava, make Perumal a Shiva and worship his Lord. Agasthya entered the temple with Tiruman Nama on the frehead, Tulsi mala around the neck and worshipped holding Lord Shiva in his heart. The conch in Vishnu’s hand changed into deer, Tulsi into crescent moon, Tilak as forehead eye and the ratna in the chest as the serpent. Agasthya pressed the head of Vishnu with his hand letting it go down and down till it got the form of a Linga. Agasthya got the Shiva Parvathi wedding darhsan immediately here itself. It is still believed that the Devas are worshipping the Lord in the temple during the day and Sage Agasthya during the night. The finger prints of Sage Agasthya on the Linga are still visible. Lord Shiva worshipped by Agasthya at Ilanji is praised as Iruvaluka Nayaka. It is suggested that devotees should worship Iruvaluka Shiva first before proceeding to Kuttralam for full gain. 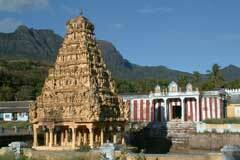 The temple was in the shape of a conch when it was a Vaishnavite shrine. It is so now too. The devotee can observe this form on his/her way to Shenbagadevi temple. Conch represents the power of Mother Mahalakshmi. The sound gives energy. Hence, conch is blown during Shiva pujas. 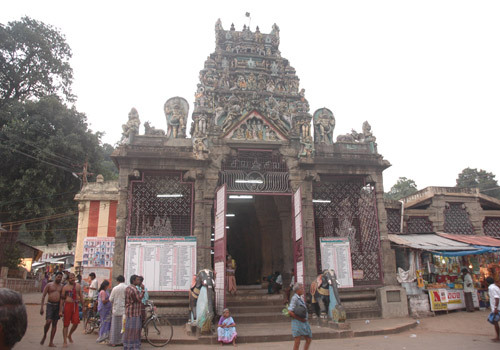 Kuttralam temple is 5 km far from Tenkasi. Kuttralam is reachable from any corner of Tamilnadu easily. Bus facility is conveniently available to Kuttralam from Madurai (155 km) and from Tirunelveli (60 km).